Gone are the days when the only choice you had for finishing your walls was solid paint colors that ended up fading into the background. Now there are options available that don’t just look amazing, they are truly worthy of being the focal point of any room. 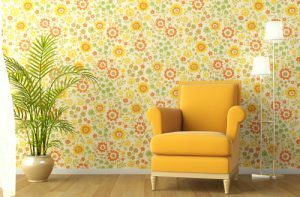 So before you decide on just another lackluster paint option, why not delve into find out more about the world of choices with wallpapering and specialty finishes? Wallpaper alone now has a vast assortment of different looks and finishes. From textured to metallic and everything in between. However, the good news is that now you also have some of these amazing options for painting as well. Chalkboard – Transform your walls into a space where young minds can get creative. This enables kids of any age to constantly express themselves, as well as creates an ever-changing look for your walls. Also a perfect idea to use in spaces where you need to write out to-do lists and family reminders, such as the kitchen. Metallic – Add some shimmer and glimmer to your interior with metallics. This specialty finish reflects light and adds sparkle to any room. Add true glamour to your home’s interior with the look of brushed precious metals. Suede – This is a popular option because of the soft and subtle but dramatic brushed suede look. This option adds warmth and depth to whatever room you choose to use it in. Pearl – Like metallic, this adds a layer of shimmer to your room. However, this is a more subtle and subdued alternative approach to metallic. It may not steal the show but it will still command attention. Stone – The perfect addition to homes that also utilize touches like woven wood shades. Available in earth tones, this specialty wall covering comes in a textured matte finish. The bottom line is that your imagination is the limit when it comes to wall covering options these days. Why settle for anything less than fabulous with all these choices that you now have? The important thing is to find an industry Canberra painter expert to work with to take care of this for you. If you are looking to transform the look of your Canberra home from ordinary to extraordinary, you came to the right place. Our small, family operated painting experts are ready, willing and beyond capable of providing you with whatever you have in mind. Let Fusion Painting show you the endless possibilities and then help you make a choice that will work for you. If you are looking for Canberra Wallpapering services then please call 0417 685 211 or complete our online request form.